Hi Everyone! It is me!! Jolena!!! I am the niece and Godchild of the author of this Blog. I am pretty sure that I am more famous than my Uncle,Chriz. I am two years old and I can talk a few sentences in two languages (Tamil and English). My mom says that I am very naughty. I eat all the time. I love eggs and i always tell me my mom to make me Bulls-eye. I am a perfectionist and hence if the yellow is not in proper circular shape, i start to cry. My mom pinches me sometimes. But she is scared that my brother might dial 911 for our safety. So on most occasions, I have things going MY WAY. My uncle is busy these days with some aunt.My Uncle is my mom's younger brother. I call my mother,momma and I call my Uncle, maamaa. The relationships are so confusing for a little girl like me. I am not sure whether he is really going around with that aunt because my Mom said," Chriz maamaa doesn't have the talent to woo a girl". She also said,"Barking dogs seldom bite". I never understood the meaning of that sentence. But anyways, as my uncle is busy with that aunt, he asked me to write a blog post on his page. So I am just taking a little bit of time from my busy schedule to write this post. I am gonna write about brother-sister relationships. You all know, that I always add lot of pictures when I narrate a story. My uncle copied my idea and that is how he became famous. Let me come back to the topic on sibling relationships. This is my mom and my Uncle when they were kids. My mom was five years old and my uncle was just two then. 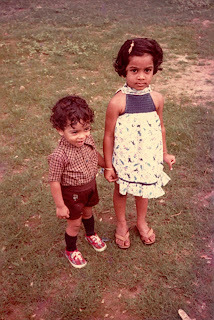 My uncle was a brat and he used to pinch, kick and bite my poor mom. But now they are great friends. This is me and my brother. He will turn 5 soon and I am 2 years old now. We are great friends too but at times we fight too. I love to dress up in matching colors. Do you have a fashion sense like me? He is also good with the computers. My brother might soon start a blog also. My brother is a leftie. He plays the guitar left handed like Paul McCartney. I always play with my doll. I also love to play basketball. But I don't know the rules of the game. There are no rules when I play the game. I make the rules. This is our new tent. I love to play alone in the tent. But my brother doesn't respect my privacy on most occasion. During such times, I would throw tantrums and my dad would come and solve the matter for us. Apparently the tent is now missing from our house. I think that my mom has hidden it somewhere. I love my Dad. I call him "Dada". Dada is my brother's physical trainer. He takes us to the playground and trains my brother to perform gymnastic stunts in the playground. I watch all these action from the swing. I love playing in the swing. Nirmal uncle is my Mother's cousin. My mom taught me to call him "Chithappa". That was tough for me. So i devised my own way of calling him and I call him "Pachi". One day Nirmal uncle (Blue shirt) came to our place. When no one was looking at me, I bit my brother and ran away. My brother was very cross with me and started chasing me. I ran behind my Pachi and he saved me from getting beaten up by my brother. One day me and my brother were watching TV and we saw some men fighting on TV. My mom came to the room and said," Who made you watch WWE?" in a very rough tone. She switched the TV off and asked us to go and play. So me and my brother decided to play Towel wrestling. He grabbed me,lifted me up and threw me away. I flew like a bird. But In Round Two, I gained upper hand and in fact I went on to pin my brother on the mat. My dada counted 1,2,3 and I won. I knew that my brother lost on purpose to make me feel happy. He is a good brother. At the end of the day we would be so hungry and we would end up sitting in the kitchen like this and watch our momma cook food for us. My maamaa says that he is busy with this aunt.He sent many photos of this aunt to my mom. Her name is Divya. I am not sure if he is telling me the truth or not. In my life, I have never seen a confused soul like my uncle. He might be speaking the truth. He might be cooking up stories. I don't care because even if this aunt comes into his life, he would still be writing about me and he would still be my maama and nothing can change that. I know that I am his only God Child. I can see that Jolena loves pink!!! Hah!! Jolena beats you to the punch when it comes to writing a 'pretty darn good' post Chriz...my suggestion is, you leave the blog to focus solely on Divya (and thus prove your sister wrong. let the world know a dog can bite too), and allow Jolena to take over the blog. we elder brothers always loose to our younger sisters. initially on purpose, later on cause they grow up to be bigger and stronger! and say hi to divya bhabhi ji. Hey It was great knowing Jolena!! And tell me is this Divya for real or are you making up a story? so sweeeeet!! Jolena is so cute! trying to imagine Jolena actually narrating this...:) love it !!! Simply the best. I think you face serious competition from your niece. Better concentrate on Divya and leave the blogging to Jolena. Jolena does have an awesome fashion sense. "So on most occasions, I have things going MY WAY." Way tyo go Jolena!!! you know I love seeing pics of them. She is so freaking adorable.. and he is a handsome young man! Chriz, your girl is pretty! Jolena honey that was very pretty write-up and some lovely pics!!!! Ur uncle is a brat, ask him to get settled soon!!!!!! Very cute post! Neat idea Chriz. And she's just adorable! LOL @fashion sense pic! Hot sunnies there babez! I'll come get a fashion tip from ya ok.
Chriz, both u and ur sis look so very cute in that childhood pic! So this new aunt ur niece is talking abt...is that true? :) She's pretty! Awwwww tat was one cute post by u chriz.. Jolena is choo cute.. Cute post, for starters (and god-child kittendhu poi idealaam filch panreengala, kadvule, kadavule!lol) :). Secondly, I trust - and hope - you are saying the truth. And I do not quite agree with Jolena. Chriz (ungil) has arrows of clarity through the eyes of confusion if I can say that. Hi, Thanks for visiting my blog and dropping a comment. You have an amazing and interesting blog ! Oh Jolena babyy..I don't have a 'fashion sense' like you..do teach me! You're sucha cuteheart! but divya is too good 4 chriz,dun u think so jolena? :D i know Jolena tells only truth! and i believe her.. she said "He might be cooking up stories." 100% correct! she too knws.. This is such a lovely post!! Jolena is too adorable!! aww the kid is so cuuute! Even the niece is clueless!! Oh thats so cute..jolena is adorable! tht was an utterly cute post!! :P :) Loved it. So Sweet da !!!! Jonela Rocks as ususal ....Gues ur sister must get tierd taking snaps ... put uncle pugal konja jasthi ya irkuthee ? Nalla than ba eluthura (U r writing pretty well) Photos r too gud!!!!!!! Jolena surely is a celebrity in the blog world now :) ..
N wats with the new aunty story ;) ??? Jolena sweety...i wanna see a pic of ur maamaa n Divya together...wont u take a pic on the sly ?? i so love your post. You are a great maama indeed. and your blog looks cool - keep the humour rolling. jolena dear, u write so well.. have u seen ur aunt? adella ok unga mamaa vuku oru hai solliru , what is ur sweet name my dear papa? I love the stories you weave around your nephew and niece..They are super cute !! How have you been, bro'? Yes, I guess I'm back - at long last. lol, so even the kiddos do not believe that their is a lady in ur life!!! But the kiddos share such a lovely bond!!! i m so in love wid ur cuteness so much..
Give her ALL the love. My share also. you have a very interesting perspective when it comes to bloggin..
kudos to u for that..
btw where r ya? did u run away with ur girl? Is that you in First Pic?? :) And LOL at WWE... let me be the special guest referee next time!! hey jolena.. u hottie... !!! what a fun life u have and seriously great pics.. Wooo hooo..
altho i find u really nice, but u gotta share ur mamaa ji with me.. no compromises on that babes. What a lovely post Chriz!! Enjoyed it from the beginning to the end!! Applause!! jolena is just like a princess..